"Gosh, Lexi," you say, "I'd love to have a garden and grow some of my own food, but I don't have a yard. Is it really worth the effort if all you can do is pots and planters?" That's harvested from the roughly 4'x6' patch of dirt we have in the oversized planter by our apartment building's parking lot. 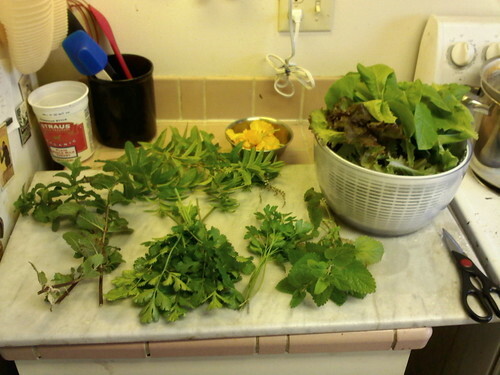 Two varieties of lettuce, parsley, cilantro, mint, lemon balm, lemon verbena, and nasturtium blossoms. Plenty left on the plants (I go for the cut-and-come-again varieties), as well as a fair bit of empty dirt that needs (lots!) more plants in it. Mwa-ha-ha. Lunch today was salad with lettuce and parsley from the garden. Yum. and trying to grow tomatoes.